An occasional feature showcasing music by little-known artists who (generally) only put out one or two albums. 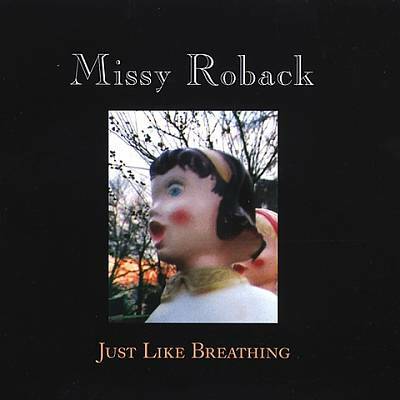 Just Like Breathing, from 2002, is the only album author and singer/songwriter Missy Roback has released so far. That’s quite a while ago at this point, though she did contribute a song to a 2012 tribute to the Reducers, an influential band from her home state of Connecticut. I’m not sure why another album hasn’t been forthcoming, as Just Like Breathing was very well received in the press, and the track “Compass” was used in then-hot TV show Felicity. Most importantly, though, it’s a strong collection of songs which still stands up well. The name “Roback” will ring a bell with any acquainted with 80s psychedelic/jangle-pop band the Rain Parade, as Roback’s husband Steven Roback co-fronted that group. He produced this album and plays many of the instruments as well. In reviews of Breathing, Missy Roback’s voice was often compared to Aimee Mann’s and Mazzy Star’s Hope Sandoval. I hear the Mann connection, but the Sandoval one is less apparent to my ears; it’s a handy comparison however, being that another Roback (David, brother of Steven) is the founder of Mazzy Star. There’s a toughness, but also a vulnerability in the way Roback delivers lines like “Babe, the snow fell today…” (“Compass”) or “Remember the times, remember the days / I wish on a star you loved me that way” (“Nearest Star”). The music on Just Like Breathing falls on the high end of the introspective folk/pop meter, with Roback’s guitar (plus additional electric guitar provided by Leigh Gregory) adding a gauzy, fuzzy sheen to some tracks, like a low tidal roar or the sound of glacial ice shifting. The ambient dream-pop “Sleep with the Mermaid” closes Just Like Breathing, offering a feeling of resolution and the lines (directed at the listener?) “Wishing you the love we feel tonight / I hope you find the one you lost tonight”. Nice voice. I like the relaxing ambiance that permeates her music. Somewhere in the foggy past I’ve read about Missy before. I’m glad you wrote this article. The music world is full of obscure musicians, many of whom are/were really good. Such as Missy. Indeed! And without the Internet, a lot of them would be lost to the winds of time…. Agreed, she has an awesome voice and is an awesome songwriter. worth repeated listens. Great guitar work on the album, too, Steven!